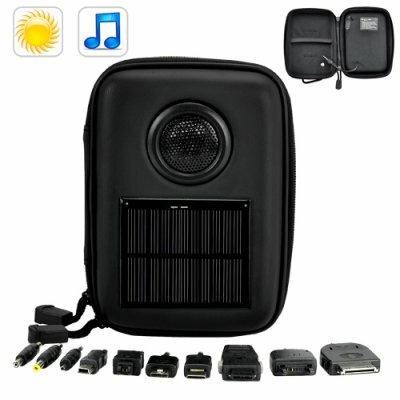 Successfully Added Solar Battery Charger with Speaker (Cell Phone, iPod, PSP, more) to your Shopping Cart. Ultra portable solar battery charger with built-in speaker. Charge your iPod, iPhone, MP3 player, PSP, and many other electronic gadgets at any place and any time. With 10 unique adapter tips, this portable solar battery charger can act as an emergency power supply for your mobile phone, MP3 player, MP4 player, PSP, iPod, PDA, and all kinds of portable electronic devices. Power is provided by both USB charging and solar energy, which means you can fill the internal battery up at home by USB, then take it with you outdoors and leave it under the sun for an all-day power supply. The compact and strong protective black case allows this portable solar battery charger to cover and shield all of your portable electronic devices while charging. The solar panels on the outside are just as durable and resistant against drops and other shocks, which makes it perfect for mountain climbing, camping, and frequent traveling. Also, while this portable solar battery charger is large enough to contain most portable electronic devices, it is also small enough to place inside a briefcase or hook onto the outside of a bookbag and convenient enough to carry anywhere. A powerful built-in speaker is also available and provides sound to any device with 3.5mm jack. Store your MP3 player or cell phone inside this portable solar battery charger to listen to music and charge at the same time for your own mini everlasting boom box. This portable solar charger is the best solution for an emergency power supply and is always ready to go. Available in our warehouse now, order today and we'll ship it out tomorrow! Brought to you by the leader in China Electronics - Chinavasion. You call this a "battery charger", what does that mean? This product is called a battery charger because it has an internal BATTERY to store power and uses that stored power to CHARGE other products. Hence, it is a battery charger. Is it better to charge this solar battery charger with the USB cable or with solar energy? Charging this battery with the USB cable is faster than charging with sunlight. Charging with sunlight is more convenient when you are outdoors, plus it's free. How good is the solar panel on this portable solar battery charger? Even in an office building, this solar charger starts collecting energy as soon as you take it out of the box. Of course, charging it with direct sunlight will be much more effective than indoor lights. What kind of devices can I charge with this portable solar battery charger? You can charge iPhones and iPods as well as any device that can charge through USB, such as cell phones, MP3 and MP4 players, and numerous other gadgets. Is this portable solar battery charger waterproof? It is weatherproof so it withstand most weather conditions, but it is not waterproof and should be kept out of sustained rain and other wet conditions.